Biologist Group Ltd. has in its offer a large number of diagnostics tests that enable fast and efficient establishment of diagnoses and screening of the most various conditions and diseases. All the tests are of top quality and obtained from reliable suppliers, and manufactured in accordance with the highest global standards (ISO 9001 and ISO 13485), where most also have the CE marking affixed. Microbiological Assay MYCOPLASMA IES – test for UU (Ureaplasma urealyticum) and MH (Mycoplasma hominis) with antibiogram. ELISA tests are immunological tests for detection or determination of antigen or antibody titre sin the given serum sample. These methods have a widespread diagnostic use in clinical practice. In case of enzyme-linked immunological methods the indicating molecule is covalently coupled with enzyme, and quantification is performed by spectrophotometer which detects the rate by which the enzyme converts the substrate into a coloured product. There are several variations of these two methods, but the most frequently used is the non-competitive method. The prevalently used enzymes for conversion of substrate into a coloured product are, for example, p-nitrophenylphosphatase which is converted into yellow p-nitrophenol by alkaline phosphatase. Competitive ELISA method (Enzyme-Linked Immunosorbent Assay) is an option where a couple of antibodies is not available for the target molecule. The enzyme horseradish peroxidase is used that may be coupled with either with antigen or with primary antibody. 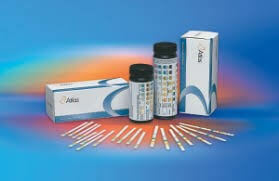 ELISA kits of manufacturer Demeditec Diagnostics GmbH contain all the necessary components required for quality work. Long years of tradition represent a guarantee of high quality along with the fact that the company has EN ISO 9001, EN ISO 14001 certificates and that it operates in accordance with the IVD-Directive 98/79/EEC. Rapid immunochromatographic tests have a significant place in modern diagnostics. These tests provide results in a very short period of time thus enabling efficient creation of adequate therapy. CoproStrip H.pylori – rapid immunochromatographic tests which detects antigen Helicobacter pylori in faeces samples. CoproStrip GDH + Tox A + Tox B – rapid immunochromatographic tests for simultaneous determination of presence of toxin A, toxin B and glutamate dehydrogenase GDH in faeces samples. 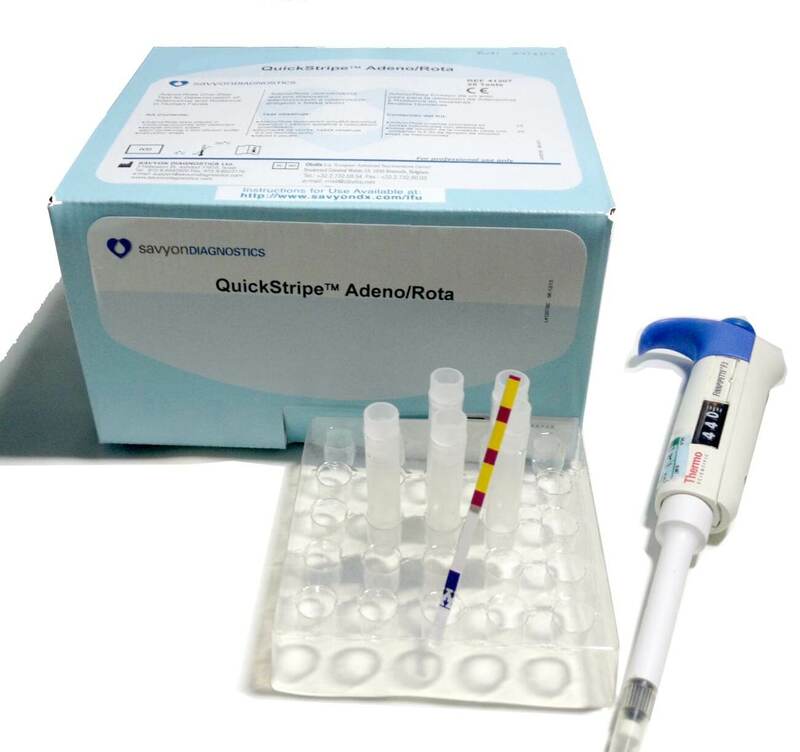 QuickStripe Adeno/Rota – rapid immunochromatographic tests for qualitative detection of antigens of adeno and rota viruses in human faeces. QuickStripe Strep A – rapid immunochromatographic tests for qualitative detection of Strep A The test is intended for diagnostics of Group A streptococci i.e. of streptococcal induced pharyngitis from throat swab. QuickStripe hCG – rapid immunochromatographic tests for qualitative detection of human chorionic gonadotropin (hCG) in urine and serum. QuickStripe RSV – rapid immunochromatographic qualitative tests for detection of respiratory syncytial virus RSV from nasopharyngeal swab. QuickStripe Chlamydia Ag – rapid immunochromatographic immunoassay qualitative detection ofChlamydia trachomatis in female cervical swab, male urethral swab and male urine specimens. Besides the standard rapid diagnostic tests, our offer includes the test that is unique on our market – H.Pylori saliva test kit. Does not require sophisticated and expensive equipment. Does not require preparation of patient with 14C or 13C marked urea. Does not require expensive consumable material for one-off use needed for the exhale test. There is no need to send the samples and wait for the results. There is no discomfort for the patient and the staff like in the case of faeces sample analysis. Rapid, one-stage test for simultaneous qualitative detection of larger number of drugs and their metabolites in human urine. The package is intended for one-off use. Most drugs that are most often used in this region may be simultaneously detected by this test panel on only 5 minutes. 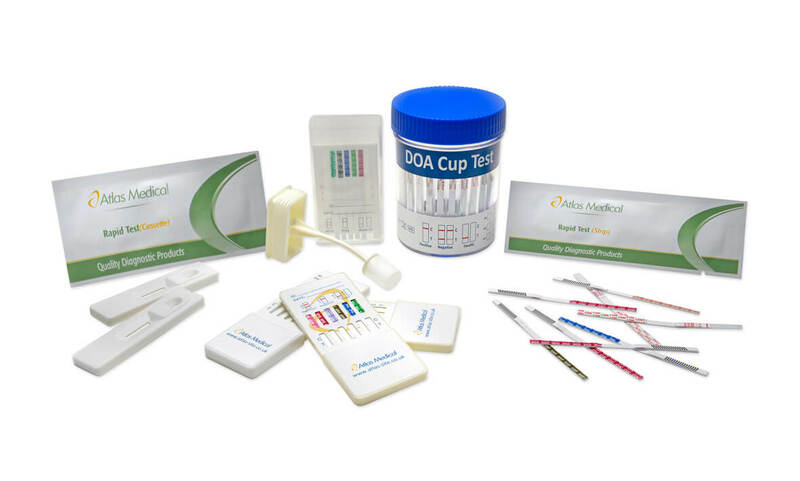 Panel sticks are rapid immunochromatographic tests for simultaneous qualitative detection of several types of narcotics and their metabolites in urine. There is panel with 5 and with 10 narcotics, but the panels may be optimised in accordance with the market requirements and demand. 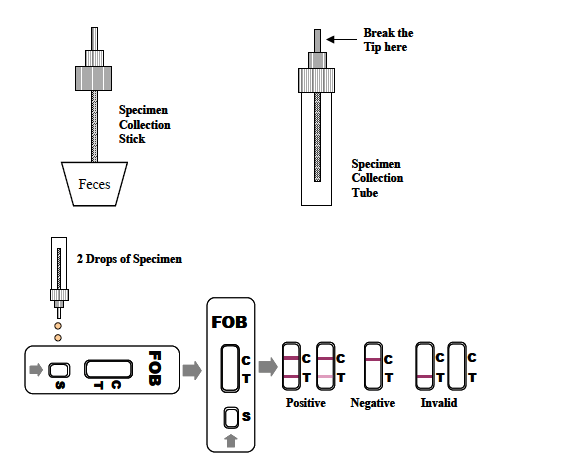 Single step test cassette for FOB (Faecal Occult Blood) (faeces) is a rapid immunochromatographic assay for qualitative detection of occult blood in human faeces. Most gastrointestinal illnesses are accompanied with blood in stool which is not visible with bare eye. In early stages of illnesses such as colon cancer, ulcer, polyps, colitis, diverticulum and fissures, the symptoms are not visible, but occult blood is present. Traditional method with guaiac resin does not have the necessary sensitivity and specific features and it requires a certain dietary regimen to be introduced prior to testing. 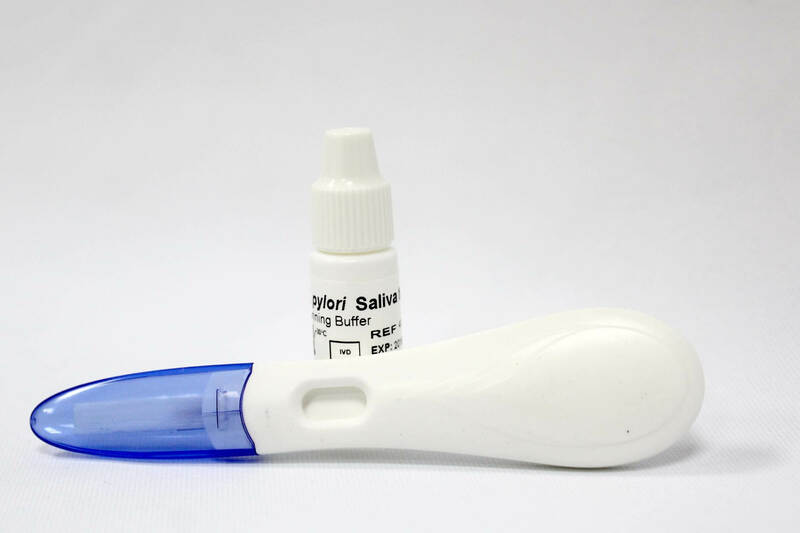 Single step test cassette for FOB (faeces) is a rapid test for qualitative detection of small quantities of occult blood in human faeces. Per type, the test belongs to sandwich assay using two antibodies, whereby we can acquire a selective detection of low levels of haemoglobin of 50 ng/mL or 6 µg of haemoglobin/g of faeces. In addition, as opposed to the guaiac resin tests, nutrition does not affect the test accuracy. Reagents urine strips are solid plastic strips with several reagents pads attached. The test is used for detection of one or more analytes in urine, including: leukocytes, glucose, ketones (acetoacetic-acid), bilirubin, blood, specific weight, proteins, urobilinogen, nitrites, ascorbic acid and pH. Urine content changes with the changes in stadiums of illness as well as with bodily disfunction prior to significant changes occurring in blood. Urine analysis is a useful indicator of health or illness and as such it is used as a part of routine screening. Reagent strips for urine may be used as a part of general health assessment, but also as aid in diagnostics and in monitoring of metabolic and system diseases affecting the renal function, leading to endocrine disorders and diseases or disorders of urinary tract. Atlas Mycoplasma IES assay represents a dehydrated medium for cultivation of bacteria based on screening, indicative counting, identification of sensitivity to antibiotics of UU (Ureaplasma urealyticum) and MH (Mycoplasma hominis) that originate from human genital-urinary tract. Choice of antibiotics is partly based on recommendations of CLSI (Clinical and Laboratory Standards Institute). Mycoplasma kit is based on cultivation and biochemical reactions. Mixed medium is prepared by mixing of lyophilised powder and diluent. Upon Mycoplasma cultivation, urea dilutes with aid of ureases deriving from UU, while NH3 is released. Also, arginine dissolves in the presence of arginases deriving from MH while NH3 is released. NH3 increases the pH of liquid medium evaluation of results is performed based on the change in colour of the indicator. Test strip contains 11 antibiotics. If Mycoplasma is sensitive to antibiotic, the enzyme activity in such case will be inhibited and there will be no change in colour. If you are looking for top quality products at affordable prices, efficient realisation and quick delivery – welcome! Biologist 2018. All rights reserved.